What a simple and fun light meal! Thank you to Lisa with foodandspice.blogspot.com for this unique recipe. Preheat an oven to 425° and line a pan with parchment paper. Cut the avocado in half and remove the pit. Scoop some of the flesh out from around the hole to make it large enough to hold the egg. Reserve the scooped out flesh. 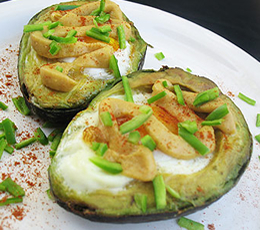 Break an egg into each avocado half and bake for 10 to 20 minutes according to the size of the eggs and how soft or hard you want them. Remove from heat. Meanwhile, mash the reserved avocado flesh with a fork and stir in an approximately equal amount of miso. Combine with the vinegar and cayenne. Add water if you prefer a thinner butter. Plate the avocado halves and spread miso butter over top. Garnish with slivers of fresh green chili and a sprinkle of chili powder, and serve warm.